The past few days have been “melty” here in Minnesota. Everyone seems a little happier and finally has a little skip in their step now that we’re seeing a glimmer of spring. The end is finally, maybe, in sight. Perfect. Except for one thing. One thing I can’t believe I’m about to say. Have I had my fill of winter cooking yet? Am I ready to trade in the hearty root vegetables and braised meats for asparagus and artichokes? I better get in a couple more soups. Maybe a stew. Better do some baking. Bread pudding? Polenta. Gooey cheese. Root vegetables. Roasts. Winter squash. Squash! No, I haven’t quite had my fill. I loaded up on it in the beginning and then it fell off my radar. Alright, tonight squash’ll get crossed off our winter eating bucket list. We’ll roast it, combine it with sautéed leeks and Brie, and use it as the filling for a savory galette. Nice, 3 checks off our list: squash, cheese, and baking. Have you made a galette before? It’s essentially a lazy-man’s rustic, free-form pie. You can make sweet, fruit-filled galettes (which, once I move into my summer eating regime, will surely make an appearance on the site) and you also can make savory galettes, like this one, with vegetables, cheese, or meat. We’ll mix up the dough for the crust first, then work on the filling. This is your basic pie crust: butter is cut into flour, ice water is sprinkled over and worked in until everything sticks together. Keep your butter well chilled and don’t overdo the mixing and you’ll end up with a gloriously buttery, flaky crust. While the crust is chilling, we’ll get the filling together. Peel and chunk a squash. Season and roast. Chop and wash the leeks. Wow, such a beautiful spring-like tint of green. 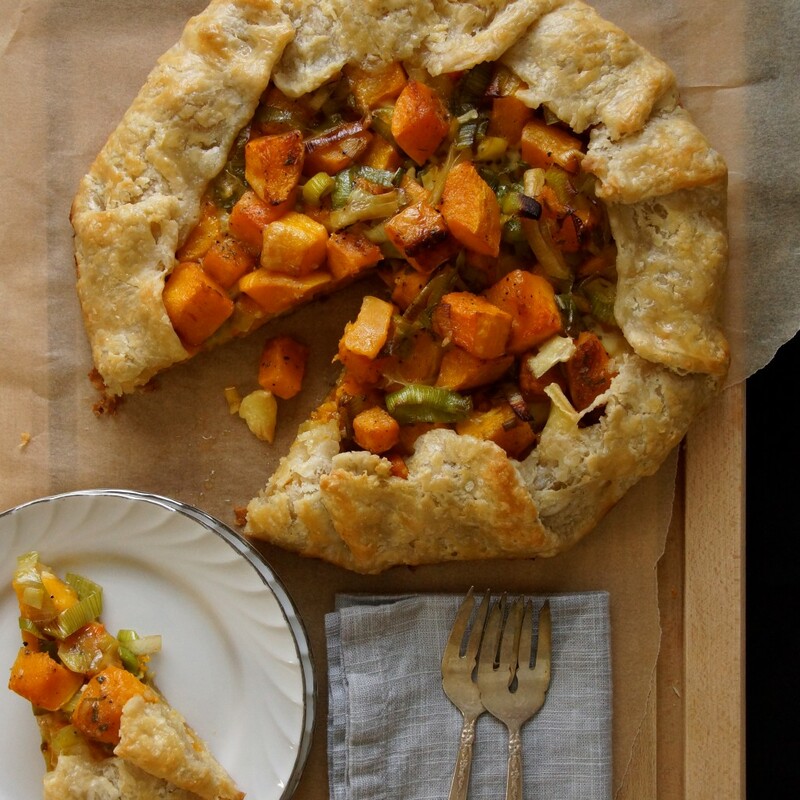 Meaningful…this galette is bridging the gap between winter and spring. Sauté the leeks with a clove of garlic and combine with the roasted squash. Bring all of the players together: the filling, the chilled crust dough, the wedge of Brie, an egg wash. Roll out the crust, mound the filling in the center, and dot with cheese. Fold the edges up over the filling and brush with an egg wash.
Savor every wintry bite of your squash galette. This could be the last of the season. 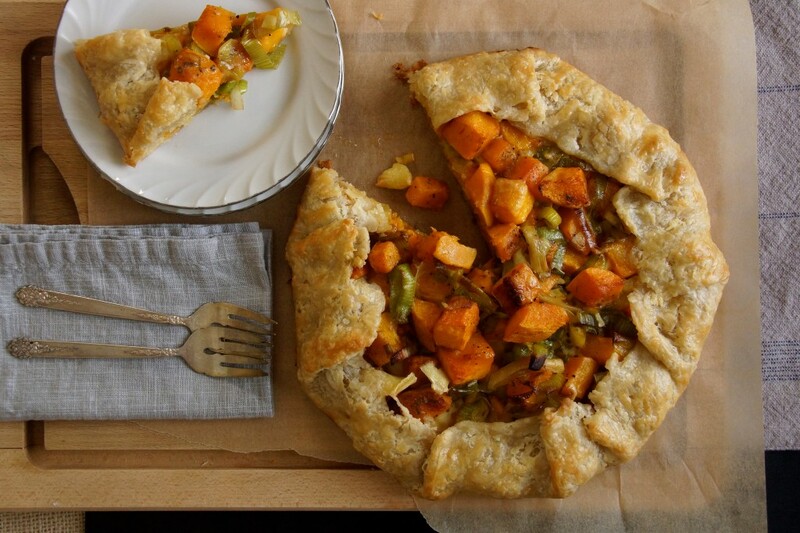 Savory galettes are very versatile. I'm equally happy eating one for dinner as I am for brunch. Serve with a salad lightly dressed with olive oil and lemon juice; the acidity is a welcome contrast to the richness of the galette. Combine the flour, salt, and sugar in a large bowl. You could use a food processor, if you prefer. Scatter the cold butter pieces over the dry ingredients and cut in using 2 knives or a pastry cutter (or pulse, if using a food processor) until most of the butter pieces are pea-sized. Sprinkle water (1 Tbsp. at a time) over the mixture and gently combine with a rubber spatula until the dough comes together. My dough required about 7 Tbsp. of water. Press the dough into a disk, wrap with plastic wrap, and chill for at least ½ an hour. Preheat oven to 375°. Toss the squash with about 1 Tbsp. olive oil, rosemary, salt, and pepper on a baking sheet. Roast until tender, about 30 minutes. Heat about ½ Tbsp. of butter over medium-high heat in a large sauté pan. Sauté the leeks and garlic until the garlic is fragrant and the leeks have softened, 3-4 minutes. Season with salt and pepper. Combine the roasted squash with the leeks. Taste and season, if necessary. Allow to cool to room temperature or refrigerate until you are ready to assemble the galette. You could do everything up to this point a day ahead, if you like. Preheat the oven to 375°. Place the chilled crust dough on a lightly floured surface and roll into a large, thin circle, about 14 in. in diameter. Mound the cooled filling in the center, leaving about a 2 in. border. Dot the top with the Brie. Fold the edges up over the filling. Whisk the egg with a Tbsp. of water and use to brush the edges of the galette. Sprinkle the edges with a pinch of flaky sea salt, if desired. Bake on a parchment-lined baking sheet until the crust is golden, about 40 minutes. Allow to cool for 10 minutes before cutting (it will hold together better). Yum, kind of reminds me of pasties, all fancied up! Love the leek pictures! Can’t wait for the bread pudding!!! Thanks, I hope you give it a try and I might have to try your sweet potato biscuits– they look awfully good! Sarah, I made this the other night and it came out perfect! My whole family enjoyed it, even my little guys 🙂 I have a friend who also made it and she loved it too. Great Recipe. I’ll be keeping a bookmark on this one. I’m glad to hear it turned out well and was even kid-friendly! So glad to hear you live in Minnesota, that way the local ingredients you find means that I should be able to find them too. I love how it shows how you cleaned the leeks by floating them in water instead of under the tap, which is so unreliable! I could see perhaps the addition of some craisens or toasted nuts, but the way you present it here makes me think I would prefer the lovely creamy texture. It’s nice to follow a food blogger that lives in your same climate. 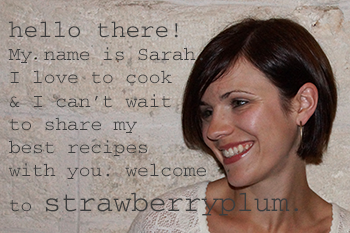 I remember reading a CA blogger talking about their strawberry season way back in April! We had just endured another blizzard in MN and I felt like weeping. I like the idea of adding toasted nuts to the galette. I’ll throw in a handful of walnuts when I make it again this fall. Thanks for reading! It’s barely starting to feel like fall in Las Vegas, but my fall weekend cooking instincts just kicked in. So glad I found this recipe. It turned out perfectly, made the house smell good and was delicious! And I enjoyed it even more knowing it originated in MN. Missing the weird weather and coziness of fall there. Love your blog! Fall cooking mode is my favorite. Glad you enjoyed the galette and the MN nostalgia!